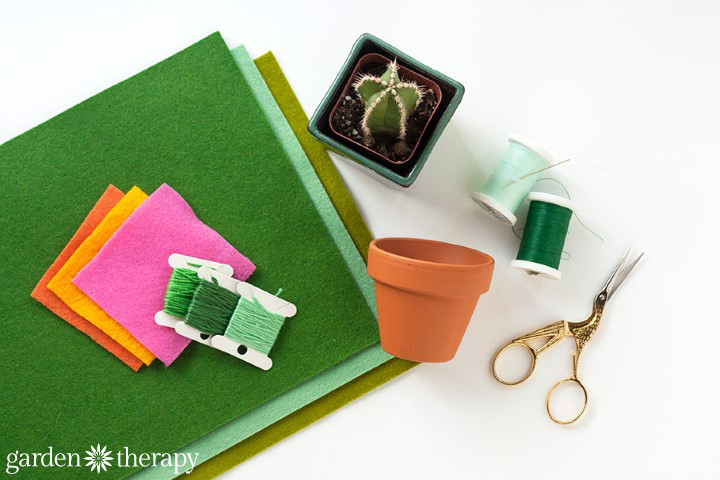 Looking for your next afternoon craft project? 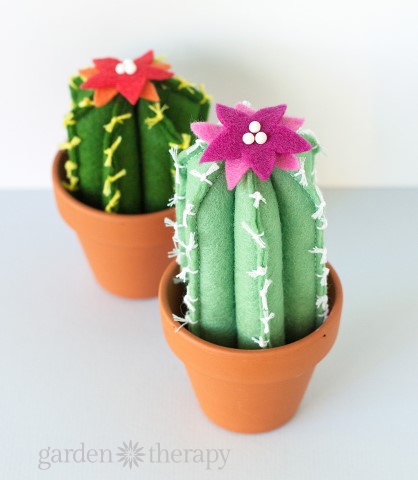 These felt cacti are not only ADORABLE but easy to make too. 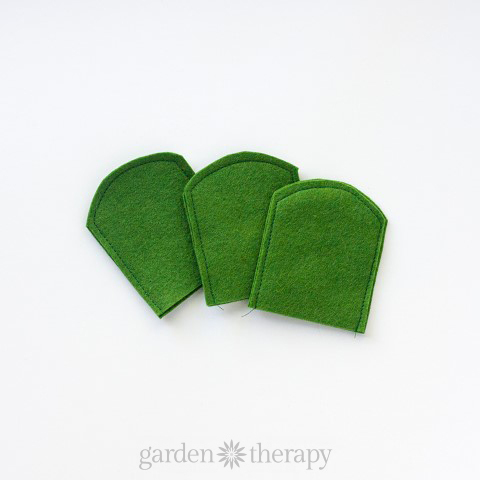 Use them to decorate your home or gift them to friends who insist they have “brown thumbs” when it comes to keeping plants alive. They’ll appreciate a cute ‘plant’ that can’t be killed. I love having indoor plants in my home. Unfortunately none of my windows receive any direct sunlight, which means that, come winter, I’m struggling to keep my little plants alive. In an effort to resist my “it’s a new year, get a new plant” urges, I decided to make up some adorable felt cacti instead. They look so cute sitting in my windowsill and come with the a few bonuses: 1) My cats don’t try to eat them and 2) They can never die! The following lists may include affiliate links. 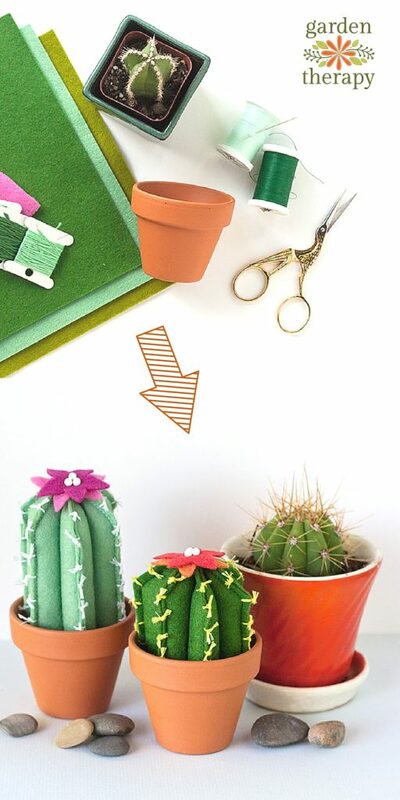 Or get all the supplies in one place with this DIY cactus kit from Etsy. This project is great for beginners. I used a sewing machine simply for efficiency, but you could easily stitch everything by hand. 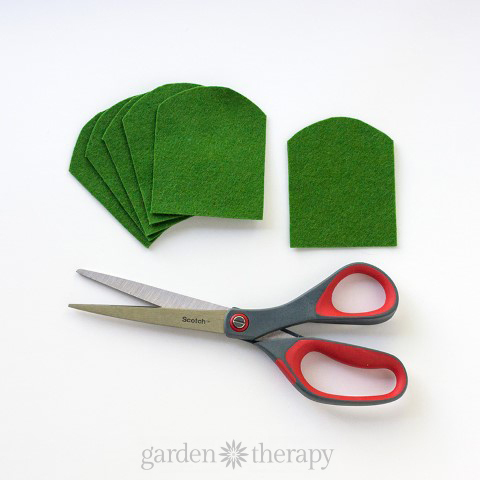 Choose a green colored sheet of felt and cut out 6 rounded dome shapes as shown below. You can make your own paper template first or cut out one shape, and use that as a template for cutting the other 5. Keep in mind the width should be about the same as the diameter of your terracotta pot. The length can be as long or as short as you like (depending on what type of cactus you like best). 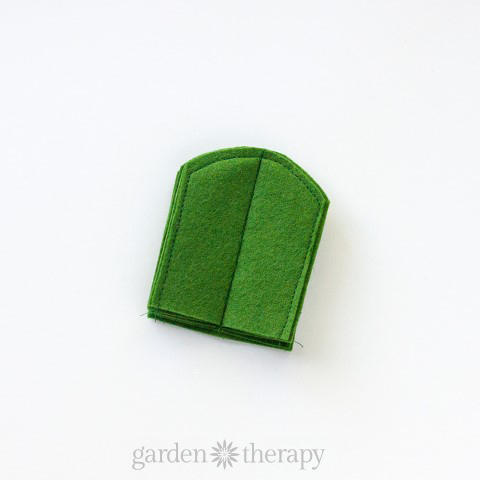 Pair up your cut pieces and sew along the edge, leaving the bottom open as shown in the photo below. Next, stack the three sewn pieces on top of one another and sew a line down the center, through all 6 layers of felt. Stuff each section with fiberfill. I used a pencil to help stuff each section nice and full. Now your cactus is starting to take shape! 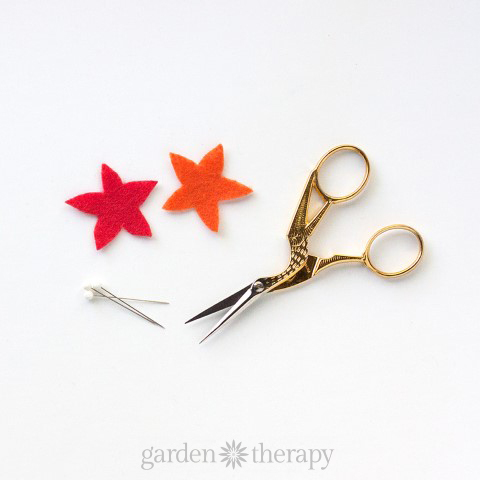 Next, choose some bright colored felt and cut out two little flowers (to be layered on top of each other). 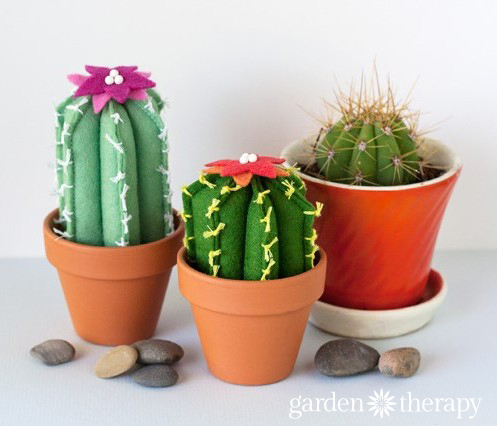 Use three pins to secure the flowers to the top of your cactus (the pins creating the center of the flower). You can also use embroidery floss to add more detail. I tied tiny knots down the edges to resemble pokey spikes. 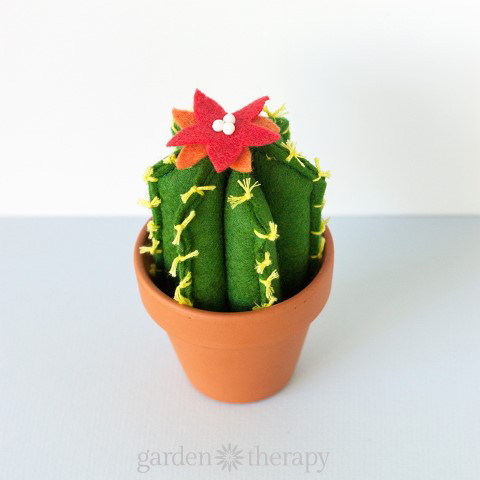 Once you’re finished, insert your cactus into a terracotta pot and you’re done! 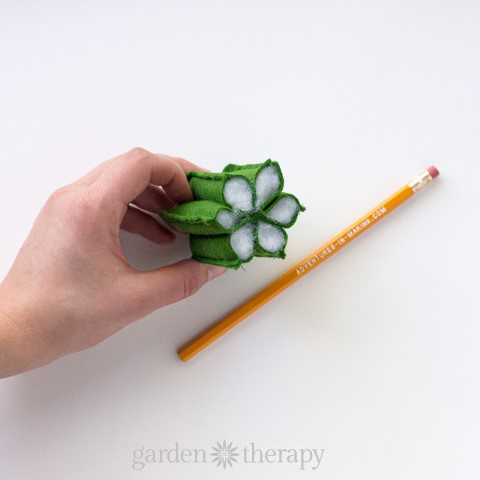 Love this crafty project? 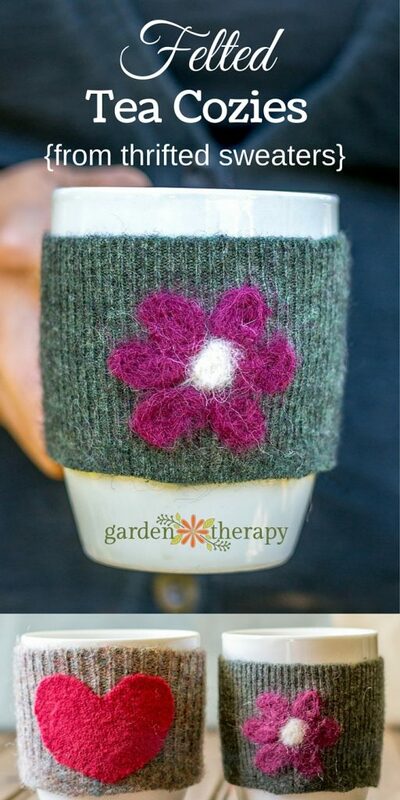 See more ideas in our craft gallery here. 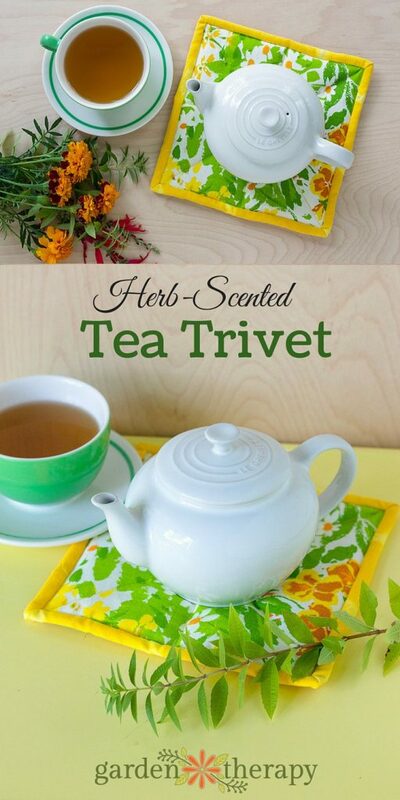 How to make this herb scented tea trivet that warms and releases fresh scented herbs like cinnamon, mint, or lavender! 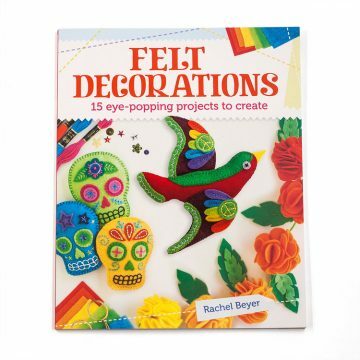 And be sure to check out Rachel’s book, Felt Decorations: 15 Eye-Popping Projects to Create, for even more unique felt projects! Rachel Beyer is an artist, designer and creative maker living in Portland, Oregon. She spends her days working at Molly Muriel Apothecary and blogging at Adventures In Making. Her favorite hobbies include cooking, gardening, and crafting. 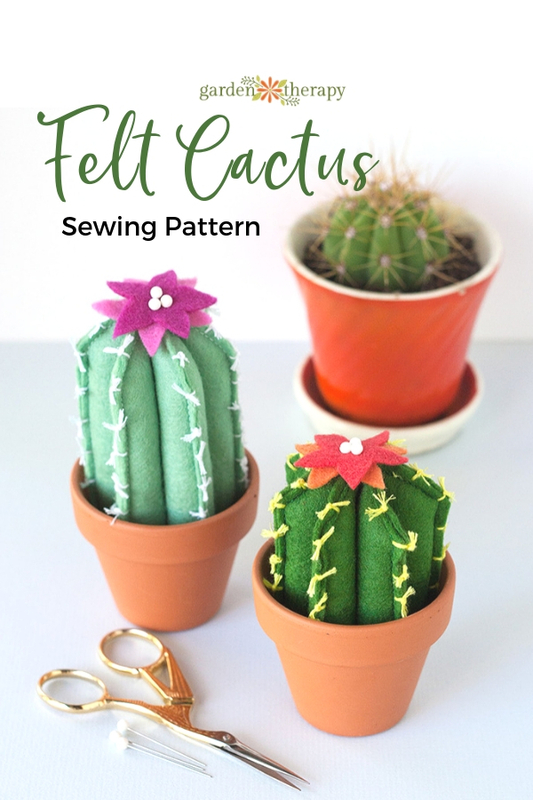 Randi, try threading a needle with embroidery floss with no knot in the end- and poking through where you want it to be on the cactus, pretty close to the edge. Pull it through but leave a tail that you can tie in a knot. Tie a couple knots and then clip off. When you get as many as you want you can trim so they are all the same length.